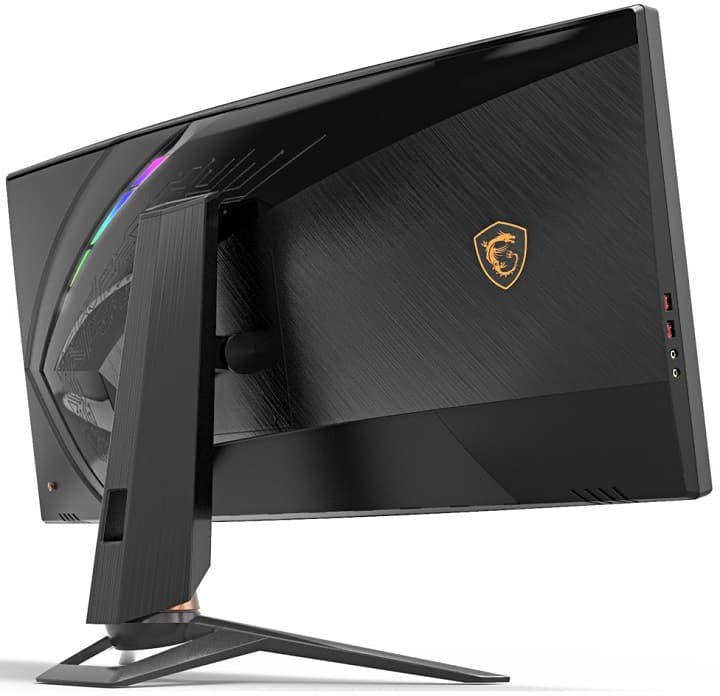 The MSI Optix MPG341CQR upgrades the stale ultrawide segment with a 144Hz 3440 x 1440 screen and AI assistant compatibility for cutting-edge convenience. This was conceptualized with gamers and streamers in mind, unlike the editing-oriented Prestige PS341WU. The MSI Optix MPG341CQR will arrive by summer of this year, so let’s check out if its preliminary specs make it the perfect option for you. The MSI Optix MPG341CQR offers a unique package based on its functionalities along with a slightly redefined aesthetic. The monitor is easily one of the best looking displays at CES 2019 thanks to its sleek lines that are laced with RGB lighting. The display is bezel-free, but there appear to be some thin panel borders apparent on three sides. The thicker bottom bezel has an array of LED strips which most likely is compatible with MSI’s Mystic lighting and a few gaming apps such as SteelSeries GameSense. Frankly, this implementation is more effective at making a build look sweet since its readily visible to the user. The MSI Optix MPG341CQR isn’t your typical ultrawide because it packs a few nifty features which modern gamers will find useful. The monitor has a built-in mouse bungee to lessen the mess brought about by cables on your desk. There is also a camera mount for streamers which MSI reps revealed are strong enough to hold some compact DSLR models. However, users can still stream with the MSI Optix MPG341CQR even without expensive cameras since there is a built-in unit at the bottom of the screen. There is also a concealed microphone along with it, but it isn’t meant for voice comms. MSI says that the mic is intended for AI integration, although the brand did not reveal which brand they will use. 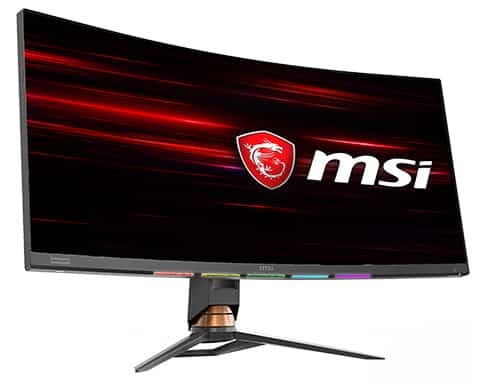 Connectivity specifications for the MSI Optix MPG341CQR aren’t definite at this time, but the 3440 x 1440 screen at 144Hz will require the latest versions. We will most likely see DisplayPort 1.4 along with HDMI 2.0 slots on this variant to handle the necessary bandwidth along with HDR input signals. The MSI Optix MPG341CQR is rounded up with more LED strips at the rear for bias lighting and aesthetics, plus a flexible stand. The tripod-designed base should provide excellent balance and stability, while the tilt, height, and swivel adjustments will take care of providing the perfect viewing angles. The MSI Optix MPG341CQR sports a 34-inch VA panel with a 3440 x 1440 resolution, a 144Hz native refresh rate, and a 4ms response time. 144Hz ultrawides such as the LG 34Gk950F are few and far in between, but manufacturer roadmaps say that there are more coming. 144Hz UW-QHD displays will become the next standard, although we hope that the upgrade will not incur a hefty premium. The MSI Optix MPG341CQR’s VA panel is still slower than most, but it has a 1ms MPRT feature like most of the recent displays we have tested. This capability is substantially similar to ULMB or backlight strobing which reduces blurring drastically by pulsing the backlight. Of course, limitations such as locked features and low brightness can be expected as a trade-off of the function. But what’s fantastic about VA panels is their higher vibrancy and contrast, making them ideal for HDR-capable variants. The MSI Optix MPG341CQR hints at HDR compatibility, but we cannot say for sure unless backlight specifications and gamut target outputs are revealed. The monitor will most likely feature DisplayHDR 400 judging from the price which is the least effective minimum standard by VESA. 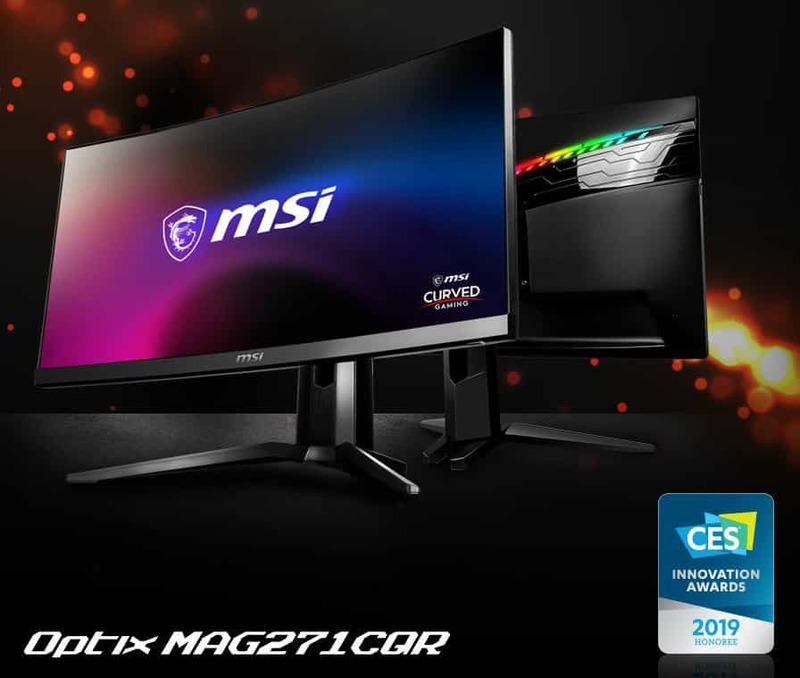 The monitor’s display goodies are enough to titillate us, but what’s particularly interesting is the MSI Optix MPG341CQR’s Gaming AI feature. MSI did not reveal if they are planning to use commercial variants such as Amazon Alexa or Google Assistant. The mere mention of the term gaming suggests that they might be developing an in-house version for the device. The AI tech’s capabilities are not final, but it will add convenience in using the MSI Optix MPG341CQR. MSI mentioned that gamers would be able to tweak the monitor or manipulate its modes with a voice command, but the applications are limitless. There could also be support for software implementations such as Windows Hello by Microsoft. The MSI Optix MPG341CQR will be a FreeSync monitor which means its price will not be affected by a premium tax. The monitor should be an excellent pair for AMD’s upcoming 7nm GPUs, but Nvidia powerhouses like the RTX series will also be suitable. This model will mostly be compatible with Nvidia’s G-Sync compatibility initiative like many available options in the market. The MSI Optix MPG341CQR is shaping up to be a fantastic option that bridges the gaps between immersive, competitive, and live stream gaming. A faster 3440 x 1440 screen is on the wishlist of many gamers. The monitor’s functional design with hidden perks will make it a best selling gaming monitor in the market when it arrives. The MSI Optix MPG341CQR is a handsome newcomer to the market, and we can’t wait to test it. This new Optix variant will start selling in summer this year with a suggested retail price $899. If that’s not reasonable, then we don’t know what is for a package like this.